Which thermostat will I use? Believe it or not, this is one of the most important decisions that you will make in ensuring the efficient operation of your air conditioning system. For your home or office thermostat to work properly, it should be installed on an inside wall as near as possible to the return air grill and approximately five feet above the floor. You should avoid having it installed in following locations: in corners, behind doors, in direct sunlight, away from any appliances or office machines that might give off radiant heat. Your thermostat, like any component of your air conditioning system, must be repaired by a qualified professional if there is a problem with its operation. Scheduling routine air conditioning maintenance is the best way to avoid such problems. Spring Hill Air Conditioning is the thermostat repair and maintenance company to call for the proper operation of your thermostat, as well as any of your other air conditioning equipment. We are just a phone call away at 352-600-4443. 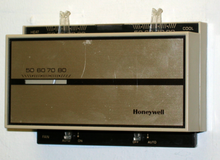 The majority of us grew up with mechanical or manual thermostats that were set to the temperature and then forgotten about. Mechanical thermostats do not have the ability to switch from heating to cooling automatically, with the low cost and functionality of digital thermostats it no longer makes sense to buy a mechanical thermostat. Your thermostat is very important in getting the most reliable, efficient performance from your home air conditioning system. A variety of different factors will affect the operation of your thermostat. Location, calibration and wiring all place a part in how efficiently it will work. A basic digital thermostat is easy to use and can help you operate your system more efficiently. The push button controls, a digital face that is easy to read makes setting the temperature easy. For homeowners interested in more advanced technology, a programmable thermostat is a great option. With a Programmable thermostat you can set different heating and cooling programs. This means that you can maintain a more moderate temperature during the day, when no one is home and program your air conditioner to come on shortly before you return home. You would program your air conditioning system to raise or lower the temperature before you get home for efficient comfort. Call Spring Hill Air Conditioning to get more information about choosing the right thermostat today. Smart thermostats that allow you to regulate temperatures in your home remotely are a big hit. These thermostats can be accessed with your smart phone, your computer or other internet enabled device. Smart Thermostats can be set to automatically adjust the temperature at a given point in time. They use a built in clock and memory to allow the user to predetermine a setting. 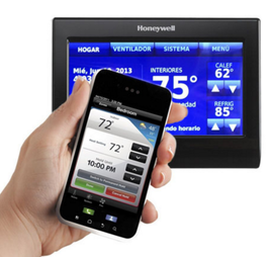 ​Interested in learning more about these advanced thermostats? We have all of the thermostat products and services you need to regulate the use of your air conditioning system. 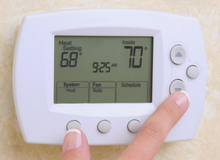 Spring Hill Air Conditioning is here for your thermostat needs.We can help. Just give us a call at 352-600-4443.